Throughout the years, multivitamins have evolved from a fitness fad to a key staple in many individuals’ health and wellness routines. People from all walks of life, who find themselves of varying stages in their fitness journeys, experience similar benefits that multivitamins offer. Recent studies have shown taking a daily multivitamin reduces inflammation levels which lower one’s risk for cardiovascular disease and diabetes, with the Cooper Complete Original Multivitamin reducing inflammation by 32 percent. While supplements provide many benefits, it is important to remember supplements are not a sufficient substitute for meals and are primarily designed to close the gaps in an individual’s daily dietary habits. 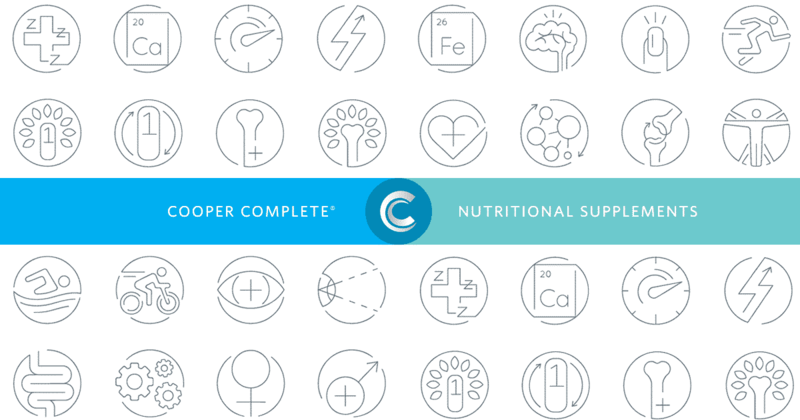 Dr. Cooper specifies in his 8 Healthy Steps to Get Cooperized™, that it is not just about taking supplements, but taking the right supplements for you according to your health needs and goals. So how do you select the right supplements for you? Where do you even start when you look at the ingredients label? Do your eyes glaze over or do you feel like you’re staring at the periodic table of elements on the back of a bottle? Men’s and women’s multivitamin ingredients and recommended dosages of each vitamin and mineral are almost identical. The main difference you will see is the presence or absence of iron across various brand names on the vitamin shelf. People who are at a higher risk for iron deficiency include women who are either premenopausal or pregnant, vegetarians, as well as long-distance runners or endurance athletes. If you experience symptoms such as weakness, extreme fatigue, poor appetite or dizziness see your health care provider about the possibility of an iron deficiency, which can usually be treated with supplementation. Always be sure to check for the key ingredients on the nutrition label of each multivitamin supplement and know how each ingredient plays its own part supplementing your wellness journey. The necessary levels of each of these elements will vary depending upon variables such as gender, age, pregnancy and previously diagnosed health conditions. Water-soluble vitamins are absorbed by tissues for immediate use of the body. The B vitamins, such as B-12, which supports energy production by converting foods from a healthy diet into energy. B-6 helps the body create serotonin that promotes good mood and brain health. Vitamin C is an antioxidant that is involved in many of our body’s functions such as boosting the immune system, the absorption of iron and healing wounds. Fat-soluble vitamins are absorbed by fat and distributed through the blood stream. Vitamin A is known for its antioxidant properties that are needed for vision, cell division, reproduction and immunity. Vitamin D is ideal for heart and bone health. Vitamin E serves an antioxidant which helps protect cells, boost the immune system and aid in blood clot prevention. You’ve successfully checked the boxes of the fundamental vitamins on your quest for the proper multivitamin for you, but what about minerals? Phosphorus is typically recommended for proper kidney function, muscle contraction and normalizing heartbeat and nerve signaling. Magnesium advocates heart health, good sleep and nervous system regulation. Potassium is efficient in reducing sodium levels and also promotes heart health. Coenzyme Q10 (CoQ10) is valuable for heart health and statin-related muscle pain. Lycopene is optimal for reducing inflammation. Lutein is an antioxidant that reduces inflammation as well as promotes eye and skin health. While the hunt for a multivitamin can be a bit overwhelming, remember they are just a piece of the puzzle designed to support and enhance your overall health. Supplements serve as an additive to your lifestyle choices, specifically your dietary habits, and fill in the gaps where there is a lack of daily intake of certain fruits and vegetables. It is always important to ask your physician or health care provider what nutrients would be right for you. Click here to shop the entire product line at Cooper Complete.